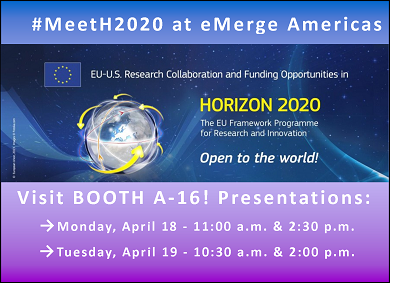 Under the framework of the Jean Monnet Project, the Miami-Florida Jean Monnet Center of Excellence will be on the EXPO floor - Section A - Booth A-16 - to present HORIZON 2020 for the European Commission Innovation & Research Projects. They will present funding possibilities for US researchers and company decision makers, and will answer your questions on Horizon 2020, Euraxess, ERC and Marie Skłodowska-Curie Programs. You will also have the opportunity to meet with Dr. James Gavigan, Minister-Counselor Research & Innovation, Delegation of the European Union to the United States, Washington DC, at the Booth on April 19th afternoon. April 18: 11:00 a.m. and 2:30 p.m.
April 19 : 10:30 a.m. and 2:00 p.m.